Francorp Chairman, Don Boroian, will be presenting a seminar at the Franchise India 2011 Expo on December 2-3, 2011 at the Hotel Ashok, New Delhi, India. This show is organized by Franchise India Bloomberg UTV with support from LIMA (International Licensing Industry Merchandisers Association) and the IFA (Indian Franchise Association). The two day platform will provide extensive learning for all prospective and existing franchisors and franchise professionals in developing, growing and managing a franchise system. Boroian will be chairing the conference and will speak on topics such as structuring your franchise model, the making of a multi-brand or franchise conglomerate, own your own business, and franchise your business. On November 14, Boroian had the privilege to conduct a seminar on “Franchising Your Business” to entrepreneurs at the 15th Americas Food and Beverage Show & Conference in Miami, FL. The conference focused on Federal and State laws governing franchising, a review of the different types of franchise strategies available for expansion, and methods in selecting the right franchise to invest with. Boroian addressed other topics on franchising such as determining if a business is franchiseable, estimated costs of franchising a business, various types of revenue streams created through franchising, franchise development and support costs, choosing the right people for your franchise and marketing and selling franchises. Boroian has been educating businesses about franchising for 36 years. Boroian, one of the most sought out senior consultants in the field of franchise strategy and business expansion, brings decades worth of knowledge and experience from his background as a franchisor, and a consultant. Boroian has served as an arbitrator and mediator for the American Arbitration Association and has been an expert witness in over 80 lawsuits. Boroian has authored industry leading books regarding franchising, including his latest book, “Franchising Your Business”. Francorp, a franchise consulting firm with 20 office locations worldwide, has been in operation since 1976. Francorp has been helping businesses achieve the next level of success through franchise expansion. Francorp has consulted with over 10,000 companies and helped over 2,000 businesses making it the world’s oldest and largest franchise consulting firm. While at Francorp, clients receive the expertise and experience needed to help expand their business to the next level. Francorp has worked with 112 of the Franchise 500 listed companies. To learn more about Francorp and how they can help your business expand via franchising, visit their website at http://www.francorp.com. Interested in learning more about franchising and/or how to franchise your business? 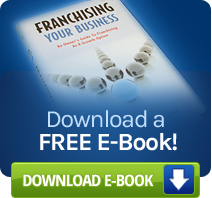 Visit http://www.francorp.com to download the free e-book and take the franchise quiz today! Need more immediate assistance? Call 800-FRANCHISE (800-372-6244) to speak directly with a franchise analyst to learn more about taking your business the next level and beyond.